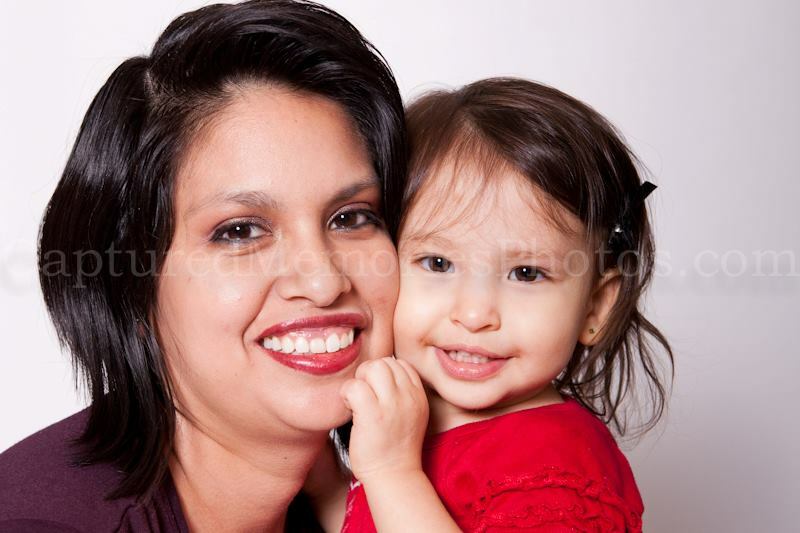 This past weekend, I took my little girl with me to get new head shots for the business website. Our photographer and friend Julie Hill of Captured Memories Photography did the work. It had been some time since I had taken photos, probably almost 6 years to be exact! Despite the fact that I needed an updated one badly, I just never took the time to get a session together and had been hoping that my six-year photo could stretch for another 6 years. At the urging of my work manager (aka the hubby) and my dear photographer friend, who gave me an offer I couldn’t refuse, it was time for me to get my photos done. I just couldn’t believe how extremely nervous I was with the initial set up. How would I position my business with just one photo, after all, it’s about me? Do I wear a corporate suit or jeans? Do I urge for a pretty landscape scene or just a plain backdrop? Do I go for something abstract, wholesome, professional or mommy’ish? Then at last-minute, as I do quite often to help me come up with quick decisions, I chose to do a simple in-studio session because I wanted my little J to see Julie again in the cool A/C. It had been a while since they last met. Julie also brought little J back a T-shirt from visiting Roma (Rome) and I was eager for her to try it on. It was the day of and I found myself scrummaging through the closet and grabbing a few dresses that people had commented on the past of “looking good” on me. Then as a back up I went to the best dress-for-less store in a jam, Ross and bought a few more options. Rarely, do I feel the need to go to the mall or spend so much $ on clothes when I could go for the kill at a discounted store. For the baby, that’s a different story but the pressure was on that I needed to go and shop for my professional photos. We arrived safely but a bit late to the studio. Of course, having bought some time putting my hair and make up together in-between stop light pauses and in the parked car for a few minutes longer. When we arrived, we were welcomed by my photographer friend and did a few practice shots on the large white background. My little J kept grabbing mommy’s legs and looking up at Julie and her camera. All she wanted was some attention from her mommy and that’s when the magic happened. She, so in tuned with being in the moment, as most toddlers do, began to embrace the camera. Of course, Julie was a great supporter of this, suggesting a few photos to be taken here and there and stealing as many shots of her as possible. We took a few head shots for me but then quickly resigned the fact that the “business” part of the business session was over as I had so much fun taking in the moment with my little one. I was mesmerized with seeing how her little character was developing right in front of the camera lens. She wasn’t shy with giving mommy a kiss on the lips or hugging mommy’s face or peacefully laying on the ground, as if looking into space. 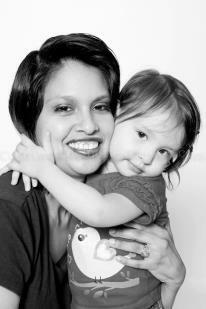 I was simply glowing at the fact that the camera warmly embraced my little girl. I forgot how this session made me so nervous hours before and it became a wonderful mommy-and-baby moment. This was even more special than I could ever imagine and in fact, my thought is to make a collage of our mommy-and-baby session as a surprise Daddy’s day gift from his two favorite girls. So I guess as a take away to this lesson in life — it’s a cliche, but it’s so appropriate and true — sometimes you gotta just go with the flow and seize the moment. I’m so happy I did. I hope you enjoy these photos as much as I do. Michelle: I was just as suprised and I am thrilled because my hubby will never know it is coming. All he knows is that I took my “headshots”. It’s always hard to surprise him, I can’t wait for Father’s Day. Laura, the shots are beautiful! Sweet Jane is growing up so quickly. I’m glad you started this blog so you can capture these lovely moments and share them with us! Laura, the shots are beautiful! I’m so glad you started your blog to capture these lovely moments and I’m glad you’re sharing them here with us too. Great meeting you today at Texas Blog Chat. Your little girl is adorable. Do you have a FB page? Thanks Rebekah! I just started my blog very recently. My personal FB page is my full name. I’ll try to find you though to make it easier.